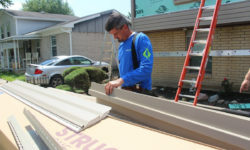 An upgrade to your home that can make the most impact is likely the siding of the home. One of the most popular types of siding is called vinyl siding and it is being used on many homes today across the country and here in Michigan. There are some advantages and disadvantages to using this popular siding however. 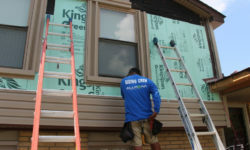 In this article I’ll discuss some of the pros and cons of using vinyl siding in Michigan on your home and why it may or may not be a good choice for your home improvement project. Continue reading to make the decision on if vinyl siding is the right option for you and your Michigan home! Depending on the type of siding your home has now may be a huge determining factor. For instance, if your home has siding that is wooden or fiber cement siding vinyl siding can be a good fit. However, if your home has stucco siding now it may be a better idea to have the stucco siding done. Mainly because with vinyl siding in Michigan it’s much easier to have the siding installed on a surface that is more solid such as wood surfaces. Installing vinyl siding on almost any surface is possible however it’s more economical to install on other harder surfaces. Depending on the type of siding your home has now may be a huge determining factor. For instance, if your home has siding that is wooden or fiber cement siding vinyl siding can be a good fit. One of the biggest advantages of using vinyl siding in Michigan is that it’s one of the most economical ways to cover the exterior of your home. Even for larger homes the cost of wrapping the home with siding is typically much less than many other types of siding. In fact, when cost of maintenance and upkeep is factored in vinyl siding gives you the best protection for your home for the money. Another huge advantage of using vinyl siding in Michigan is that it looks great and it can make an older home look very new. The colors that are offered in vinyl siding are vast and choosing a color to match your existing home’s roof and other components is easy. The color of the vinyl siding is also completely throughout the vinyl siding so it won’t fade and it will keep it’s color throughout it’s useful life. Maybe a bit of fading in extreme cases but overall a great way to keep color is by getting vinyl siding on your home. Another huge advantage of using vinyl siding in Michigan is that it looks great and it can make an older home look very new. Not only can you make your home look great with vinyl siding in Michigan but you’ll also have less to worry about. Vinyl siding requires very little maintenance. Unlike wooden siding it doesn’t need to be painted or resealed after a few years. Instead the maintenance for vinyl siding usually only involves a quick pressure wash of the home to make it look like new again. Unlike wooden siding it doesn’t need to be painted or resealed after a few years. Instead the maintenance for vinyl siding usually only involves a quick pressure wash of the home to make it look like new again. Sometimes with other types of siding like stucco it can take weeks of preparation work and application. But vinyl siding only takes a few days to install on the entire home as long as the siding contractor in Michigan is properly qualified to install the siding. One of the biggest problems with vinyl siding in Michigan is the cold weather causes it to become a bit more brittle and susceptible to damage. Hail can also cause damage to the siding if it’s bad enough just like with roofing. With the cold temperatures of Michigan it can make this a problem with lower quality siding. In order to protect your home better from this effect you can use a higher quality vinyl siding that is thicker and more protective. Both will protect your home but higher quality siding is better in terms of cracking.